In collecting and using this data, FastKlean is subject to a variety of legislation controlling how such activities may be carried out and the safeguards that must be put in place to protect it. The purpose of this policy is to set out the relevant legislation and to describe the steps FastKlean is taking to ensure that it complies with it. These controls apply to all systems, people and processes that constitute the organisation’s information systems, including board members, directors, employees, suppliers and other third parties who have access to FastKlean systems. The General Data Protection Regulation (GDPR) is one of the most significant pieces of legislation affecting the way that FastKlean carries out its information processing activities. Significant fines are applicable if a breach is deemed to have occurred under the GDPR, which is designed to protect the personal data of citizens of the European Union. It is FastKlean’s policy to ensure that our compliance with the GDPR and other relevant legislation is clear and demonstrable at all times. FastKlean will ensure that it complies with all of these principles both in the processing it currently carries out and as part of the introduction of new methods of processing such as new IT systems. Each of these rights are supported by appropriate procedures within FastKlean allow the required action to be taken within the timescales stated in the GDPR. There are six alternative ways in which the lawfulness of a specific case of processing of personal data may be established under the GDPR. It is FastKlean’s policy to identify the appropriate basis for processing and to document it, in accordance with the Regulation. The options are described in brief in the following sections. Unless it is necessary for a reason allowable in the GDPR, FastKlean will always obtain explicit consent from a data subject to collect and process their data. In case of children below the age of 16 (a lower age may be allowable in specific EU member states) parental consent will be obtained. Transparent information about our usage of their personal data will be provided to data subjects at the time that consent is obtained and their rights with regard to their data explained, such as the right to withdraw consent. This information will be provided in an accessible form, written in clear language and free of charge. In a case where the personal data are required to protect the vital interests of the data subject or of another natural person, then this may be used as the lawful basis of the processing. FastKlean will retain reasonable, documented evidence that this is the case, whenever this reason is used as the lawful basis of the processing of personal data. As an example, this may be used in aspects of social care, particularly in the public sector. Where FastKlean needs to perform a task that it believes is in the public interest or as part of an official duty then the data subject’s consent will not be requested. The assessment of the public interest or official duty will be documented and made available as evidence where required. If the processing of specific personal data is in the legitimate interests of FastKlean and is judged not to affect the rights and freedoms of the data subject in a significant way, then this may be defined as the lawful reason for the processing. Again, the reasoning behind this view will be documented. FastKlean has adopted the principle of privacy by design and will ensure that the definition and planning of all new or significantly changed systems that collect, or process personal data will be subject to due consideration of privacy issues, including the completion of one or more data protection impact assessments. FastKlean will ensure that all relationships it enters into that involve the processing of personal data are subject to a documented contract that includes the specific information and terms required by the GDPR. For more information, see the GDPR Controller-Processor Agreement Policy. Based on these criteria, FastKlean does not require a Data Protection Officer to be appointed. It is FastKlean’s policy to be fair and proportionate when considering the actions to be taken to inform affected parties regarding breaches of personal data. In line with the GDPR, where a breach is known to have occurred which is likely to result in a risk to the rights and freedoms of individuals, the relevant supervisory authority will be informed within 72 hours. This will be managed in accordance with our Information Security Incident Response Procedure which sets out the overall process of handling information security incidents. Your privacy and confidentiality are of great importance. 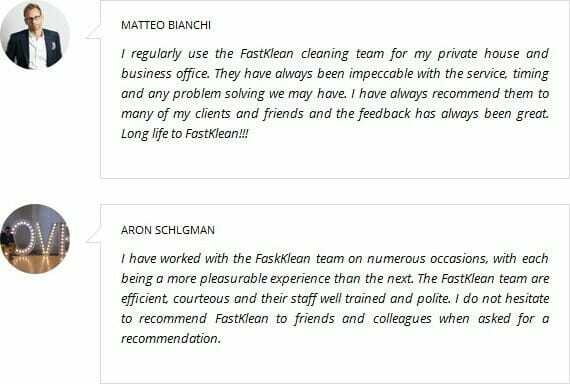 As such, this site is managed by FastKlean, we shall ensure that these things are not violated and damage your trust and confidence with us. Because we have to collect whatever relevant information from you in order to draw a contract, it is our duty to keep your details safe, and therefore, we also require our client to read all ideas related when it comes to privacy and confidentially. As such, we would like to inform you of the important and relevant details that we would like you to share with us. Our cleaning company has the right to require personal and professional data from our clients. It can be voluntary or optional depending on what is required on the online form provided on the website or as asked during phone conversations. With that, the client has the right to reserve the rights when it comes to receiving newsletters and other updates or surveys from us. Email newsletters – it is the prerogative of our customers to subscribe during registration or after doing so. The client can choose to delete their account from the mailing list should they wish to do so. Otherwise, the company has the privilege of gathering relevant information in order for them to receive updates and newsfeeds from us. Surveys – at times, we conduct feedback mechanisms in order to improve our services. Thus, we require relevant information when you want to participate in this activity. It is also our right to share all your information with our advertisers and sponsors but never to a third party. Our company occasionally use gathered information in order to achieve our objectives in giving ultimate customer satisfaction and superior services and results. We do not have the motive to exploit these in any other form of malicious activities. Rest assured that all voluntarily given data and details are used solely for the purpose of improving our services to you. It is agreed that you willingly commit and subscribe to whatever online communications that we provide to our customers whether for updating, surveys, or any other form two way feedback mechanism. Again, we at fastklean.co.uk reiterate that in no way shall we share your details with any other third parties regardless of mechanics and form. It is also our right to monitor what our readers, users, and clients are accessing with regard to our site. It is important that we have to keep track of these motives in order for us to have better ideas on what aspects people are interested in us. We do not monitor online activities for the sake of sharing and earning from third parties. We are always binding ourselves with the confidentiality and privacy contract that you engage with us. All of your data and details shared with us remain exclusive to us. Exceptions are in order if mandated or ordered by federal laws and local ordinances. With that, we shall reassure you that, all information you provide is for the benefit of giving you consistent superior cleaning services at all times. We understand that guardianship of vital and sensitive information is always a priority. Thus, we would like to inform that we always perform updating activities with regard to security matters such as passwords, profiles, and other relevant details. All of our firewall mechanisms are of industry standard and everything that needs to be done to secure your account with us are always monitored and forbidden to other parties. In this section, we give the privilege to our clients to provide reservations when it comes to provision of information. It is the prerogative of the client or customer to receive newsletters and other information campaign coming from us. It is their discretion when it comes to voluntary participation in matters of interactive communication especially if there is a need for them to divulge more sensitive information or details. When you access this site, all information gathering methods are deemed to be accepted once you agree and fill out all data gathering methods embedded in this site. All changes and alterations and amendments necessary for improvement of services and other relevant activities, we shall inform our clients prior to implementation.